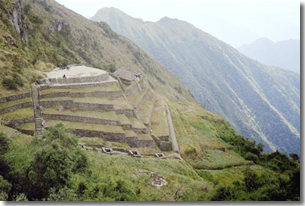 The ruins of Phuyupatamarca, is one of the most beautiful sites in the Inka Trail, almost always with clouds, typical of the cloud forests, and agricultural terraces and fountains with circulating fresh water. This ruin contains terraces, a serpentine vantage point, and an intricate series of ceremonial baths connected by water channels, all located at about 11,000 feet above sea level. The Phuyupatamarca ruins are better preserved than those seen before now.